1st Class Moving Co. is your full service moving partner when relocating. Weather your moving a home, an apartment or office, we can help! If need us to load or unload your rental truck, we can help! With over 19 years experience packing and moving homes and businesses you can rest assured that you made the right choice choosing us as your movers. 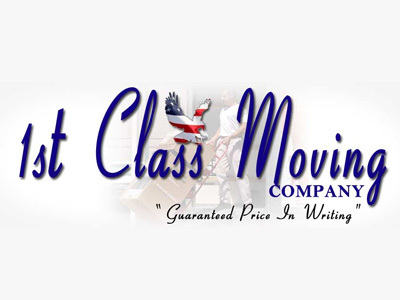 Here at 1st Class Moving Co. we are offering 1 free move a month to a family in need. We will provide labor and equipment to successfully relocate the household to the new location. Local moves only will apply. All packing must be provided by customer. If you would like to enter for the free move drawing, you need to send in an email explaing your situation and how our free moving service will help you out. Emails must have name, vaild contact number, pick-up/drop-off address, # of bedrooms, date you are looking to move, please also note any standard or specialty furniture. Our moving packages are designed for the customer on the go who just needs the standard items moved. We understand sometimes things happen; not enough time to complete an inventory or you just need to move quickly. One of our 1st Class packages may be the answer to simplify your life. Just select the package that fits your needs, enter your move information and Let's Move ... simple, quick and easy! Click to See Our Moving Packages! These are some of the questions that we hear most regarding a move. If you have questions, please ask. We are happy to answer any questions and help you with any special needs that you may have. Can we add items at a later time or on move day? You may change your inventory at any time as needed. Although we ask that you try to be as accurate as possible when filling out your inventory. Here at 1st Class Moving we know how difficult it can be to specify everything that you own. Our professionals are here to answer any questions you may have and assist you throughout your move. Will my floors be protected during my move? We offer full floor protection for your carpets, tiles, and hardwoods upon request. Using floor protection may help prevent costly accidents like slippery floors, tracking mud, or dirt on to carpet. Do you offer packing and unpacking service? Our professional movers have been trained to pack/unpack your crystal, fine china, and other valuable belongings. This service is offered by the job or on a hourly rate, upon request. How will my furniture be cared for? We at 1st Class Moving have extensive experience as antique movers and we take every precaution when handling all furniture and antiques. All furniture is padded and wrapped by our professional movers prior to transit. Can you disassemble and assemble items? Some furniture must be disassembled to be moved properly. We can perform these services upon request. Please keep in mind by having everything disassembled prior to moving will allow for lowest moving quote. Are you just a Houston Mover or are you also a long distance mover? While our office is north of Houston in Magnolia, Texas; we are a long distance mover as well as a local mover. We are a Texas moving company and operate in anywhere in the State of Texas. I am moving to Houston from another Texas city. Can you bring me to Houston? While most people call a local mover to take them to a distant city, for a moving company, it makes just as much sense for us to move someone to the Houston Area as from the area and we will be happy to help.